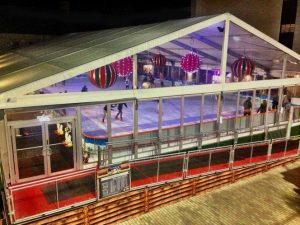 Dublin’s best ice skating venue in Dundrum Town Centre will reopen from October 2019 to January 2020. We’ve got 500m² of crisp, white ice to get you skating from Halloween till the New Year and Online Bookings are available now to ensure you get the times and dates you want. Whether you are just starting out with ice skating or are a seasoned pro, Dundrum On Ice offers the highest quality seasonal ice skating experience in Dublin today. Book for individual sessions as an individual or small group. Have fun on the ice this festive season alongside your colleagues from work or your club team mates by booking a Group Skating session. It’s an ideal Winter activity suitable for all ages and abilities. Contact our Box Office for more details. Schools from every corner of Ireland have been making the annual trip to Dundrum on Ice since 2010. A large proportion of our calendar is reserved for school groups. To learn more, tap to call our booking line. Give the gift of skating this Christmas with a Dundrum On Ice Gift Voucher. Choose an amount that suits your budget & purchase online by following the booking link below.